Inspired by Graham Rust and his book The Painted House. It is a book on Murals and Trompe L'Oeill Decor. He now has The Painted House Revisited and I am very excited to read and see what new projects he has accomplished. 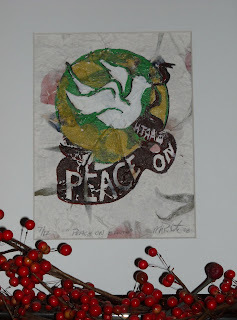 A holiday gift from artist and mentor Michael Pesselato. I love both the art and the message! The paper this is created on is wonderful. Thank you Michael! I wanted to complete this work of art before Christmas to post as an inspiration for the New Year. It may get another glaze or two, I was excited to create because of my mood, and as I have a few art exhibits lined up for 2009. While typing this post, a FedEx package arrived. I opened it and found a congratulations letter from my new employer. I could not ask for a better gift. Except of course having my family and friends near & dear to my heart. Wishing all a wonderful holiday & all the best in the year ahead. This morning the now famous Eddie Ross posted his latest DIY idea. 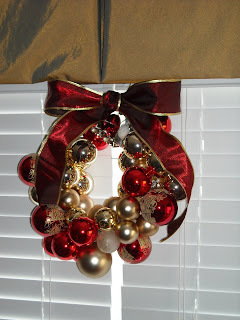 The first image is the wreath that Eddie made from leftover Holiday ornaments, as he and Jaithen like to use more unique shapes on their tree instead of the round ones. 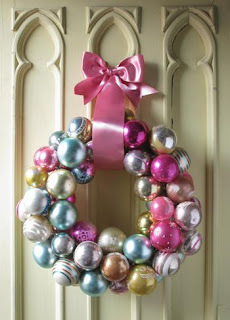 The second wreath is the one I just finished, a little crooked and misshapen, guess what though, I tried. I have not been a fine crafts person, though I am an artist. So after getting glue all over me, and a few broken ornaments, plus a bit of frustration, this is my creation! So break out of the box, don't be too hard on yourself and try something new! 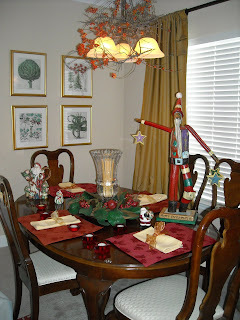 This is a Holiday table I put together while getting more Christmas decor out of the garage. It was surprising how afterwards I felt more in the spirit. Our entire huge family (mostly Catholic) celebrates on Christmas Eve. At St. Mary's Food Kitchen on Christmas Day normally the Jewish community provides & serves the food for the many less fortunate. My late husband was Jewish and so I think that will make it okay for me to go down and help too! Located at Hawthorne Plaza, The Santa sculpture is from Sticks. During the wintry months of Kansas City it is time to think about all we have to be thankful for. Hand in hand, what are you passionate about? Is it your family or partner, your career, music, dance, or art? New Year's is right around the corner. Before 2009 arrives, I encourage all of those I care for to do some soul searching and bring your passions to life! 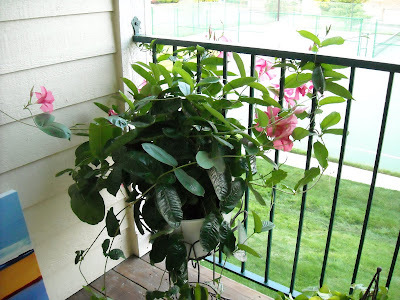 My condominium has the entry on the first level and then up the stairs to my living space. These two images show what you can do with a tiny area to make it interesting! The Fabulous Raku is by Bob Smith from Colorado. 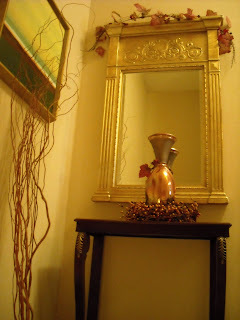 The image below shows you looking up the stairs and my favorite mirror which is actually a Henredon. Of course another work of my own art. The Rich Earth. 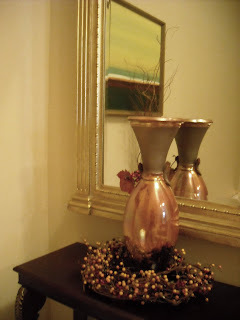 More images to show you from my home. 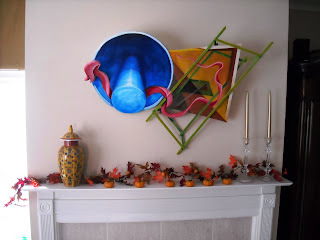 I like for people to see how you can mix it up with both abstract and traditional art and furnishings. I have a set of botanical prints scattered about along with many of my abstract and contemporary pieces. I guess I love it all! 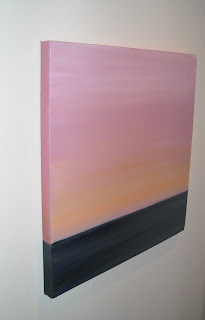 PS This painting now has the same Zen frame from Larson-Juhl I have used several times. So I need to reshoot the art. It is a great collection! I hope that Steve McKenzie agrees. 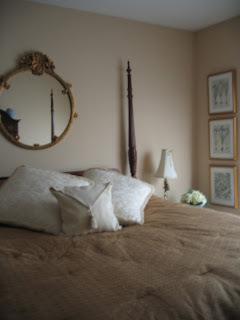 The unique round mirror over my bed is from Ballard Design. 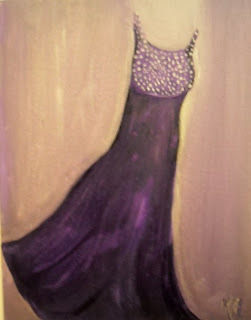 My painting of a favorite dress of mine, Aubergine Chiffon, with draping criss-cross straps plunging on the back. 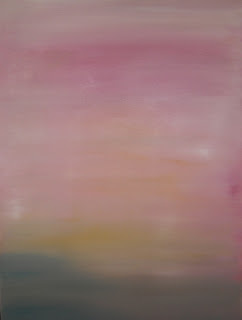 Completed to win the painting below by artist Diane Bronstein at Inspiration by Design called Ghost of a Memory. 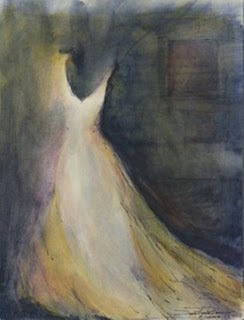 My dress brings back many special memories of a certain evening and dancing the night away. This was a complete change of style for me and I wished I could show the back of the dress as well. This journey I am taking brings me to appreciate so much that has happened in my life. This time of year, when giving thanks for all we have is so important instead of wishing and wanting more. This painting brought out a lot of emotions. 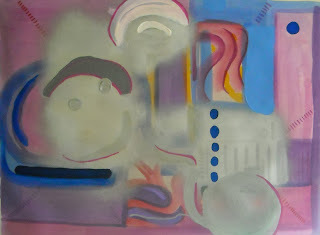 It reflects the bright and very happy times as well as the deeper and darker time in our lives. Look though, even in the difficult times, there are glimmers of light peeking through! 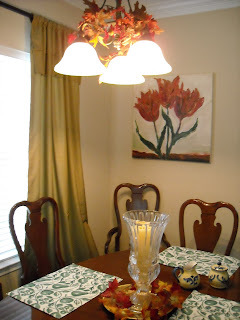 Featuring my Autumn Tulips painting in the Dining Room of my condominium. I have not decided on a Larson Juhl frame for this yet,maybe a floater design. Steve, any suggestions? 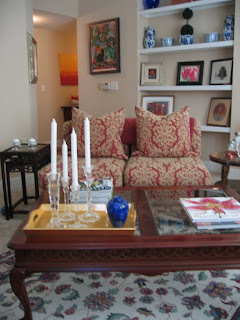 Like one of my mentors, Eddie Ross In NYC, I have the challenge of making a small space look invitingly lovely. 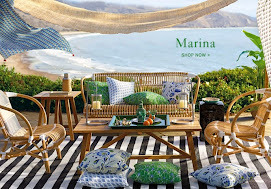 I did not do a table setting, because I usually do not have it set during normal living hours! Next time for the holiday's entertaining, I will have the china & vintage crystal, the works out for you! I could have dimmed the lights a bit on this image as well! It is now cool and crisp in Kansas City. 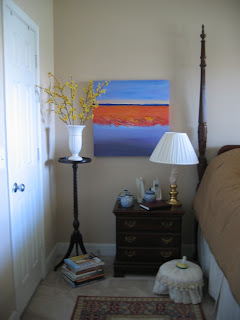 There are very simple ways to make seasonal changes without going "Over the Top" These images show that you can mix it up and also not necessarily use fall colors. The mantle setting includes a 3-dimensional work of art by Michael Pesselato. 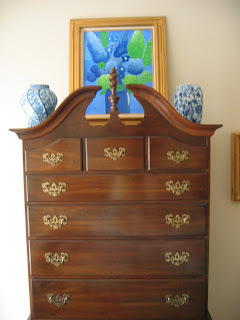 You can barely notice that next to the fireplace sits a Country French Armoire one of my favorite pieces of furniture. 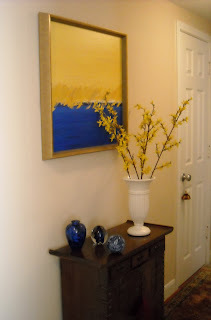 In the Hallway setting, this could also work for spring, though the rug has a lot of warm, rich color as does the oriental chest. 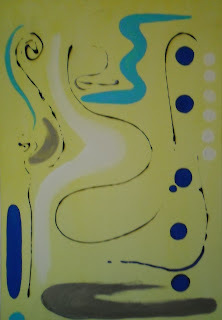 My own work of abstract art has a Larson Juhl frame from the "Zen" collection. 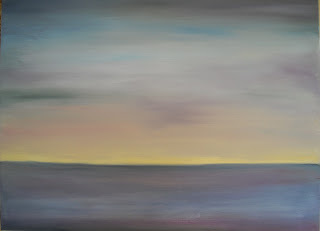 I recently read an article in Art Calendar that really made me think about the way I felt when I created this painting. The title is "Demand Grandeur" by Eric Maisel, Ph.D and I highly recommend it. It makes note that when we listen to music, see a movie or gaze at a work of fine art, we are transported to another place. This is not about grand in the traditional sense. It is about demanding of ourselves something out of the ordinary, bolder, more powerful, even if it is something that is serene; what is behind it? For some reason I love to paint in series. 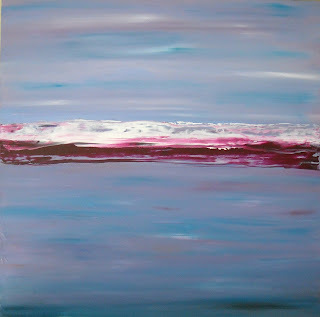 There is something about the flow and feelings that starts evolving as I create these works of art. This is a 24 x 24 size and It is indeed similar to the three 12 x 12 's I have stacked vertically and placed on a corner diagonal wall. I am now in the final stages of my ARTichokes painting. 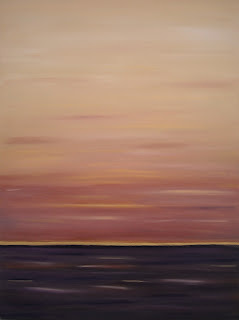 It is getting some very interesting texture at the horizon line which I love to see. 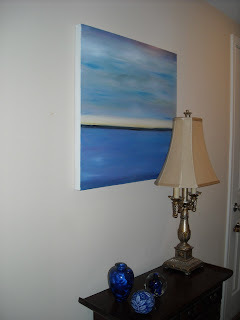 This is one of my latest paintings, "Morning Haze" paired with blue treasures from friends and family. Alongside I placed a great find from Steve Rogers sale from his booth at The Mission Road Antiques Mall. A favorite haunt for Mrs. Blandings. This is a fairly narrow hallway, so the oriental chest is not very wide, and I think it works! I began this painting last night. 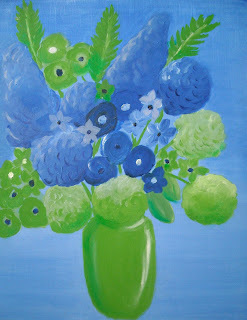 I was with a group that loves painting together at a great art space in my area called ARTichokes! They have classes for all ages, Open Studio, all kinds of fun things for kids. The partners have a come together with a very special concept for creativity. This art is in it's 1st phase. I have a few thoughts on where it might lead to, however the mystery and magic of Abstract art is that it may go in an entirely different direction from where it started! 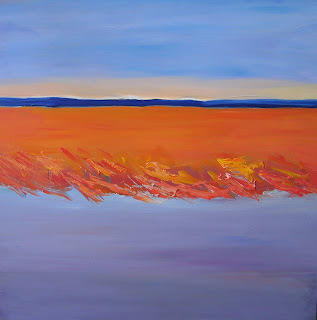 As you have seen from my posts and art slideshow, I love color, vivid, vibrant bursts of it. Sometimes though I need a little serenity and calm. This oil painting ...just finished! I will create another similar in a larger size, and donate this one to a fundraiser for St. Thomas Aquinas High School It is 18 x 22 and I picture a fairly simple silver gilded frame around it although it could go with an ornate frame for a very traditional setting. Live your Life! Love your Life! I will occasionally show images from my tiny abode. I have mentioned before that I am now in a condominium with limited space. It feels so good though and I love changing my rooms around and sometimes it may just be a change of art or moving a piece of furniture to another spot. As in Eddie Ross' post, fall entertaining, even on a small scale gives us pause to enjoy the new autumn season and colors. I will get out some of my favorite fall objects' tonight. I know how many of you are honoring Breast Cancer Awareness Month. 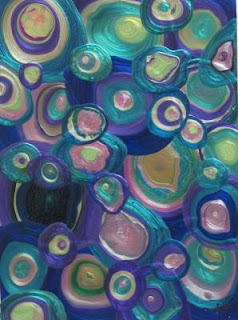 This is a painting I have done in honor of my cousin Sharon, who fought the disease valiantly for several years. I miss her very much as she and another cousin Judy were and are my mentors. In the Kansas City area please donate to the Back in the Swing organization. They fund programs to assist those with breast cancer, several organizations and hospitals, including Cancer Action. It is a wonderful center for anyone needing help both in ways both physical and spiritual. 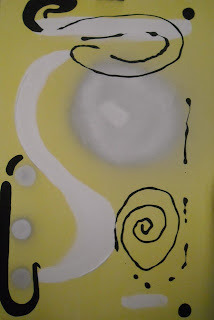 This Series, "Brightness Within", I have been creating recently, is inspired by making art with my grandchildren. It brings out wonder, joy, and yet you can catch a glimpse of sophistication in each piece. Watching the children painting an abstract, I can see the thought and consideration put into the design and strokes; even though many are very spontaneous. 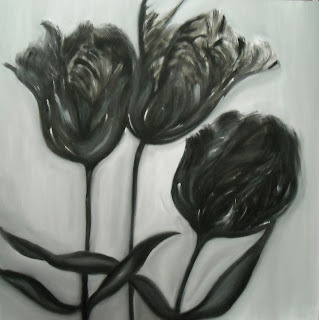 We have enjoyed classes taken together at The Nelson-Atkins Museum and going to Open Studios at Artichokes Gallery. The source of my inspiration is just endless. My friend Ed surprised me with a new red Nikon Cool Pix for my birthday. Now I can take images of my art works. ( and many other photos) My sister Susan who as a single mother works two jobs to help my nieces Gretchen and Erin obtain their college degree. 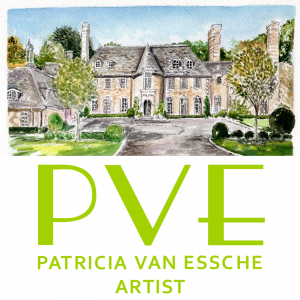 Many other artists and gallery owners in the community that have given me rave reviews! My friend Larry and his beautiful new wife Ty who came to my latest opening! Denise, who is one of the smartest women I know and with a huge heart always open! Thank you! Thank you! I will be giving credit in future posts to many others who have stayed by my side through all the great times and the rough times. Cynthia has always been the one to encourage me to follow my dreams and keep up that great "can do" attitude. When she looked at my new blog spot and saw the article about the Plaza Art Fair and the Renaaissance Festival, it was a lot for her to take in, and she was feeling a little blue. I know she misses being here, and I really, really miss her too! My Mother and Father came by today as I needed to take their truck to pick up two huge canvases at Creative Coldsnow. 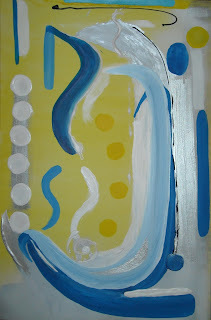 I have an inkling of a couple of projects....each needing a great deal more notes and consideration. What was I thinking! And yes, I do take commissioned projects! I am very excited to be in a current group art exhibit at The Buttonwood Art Space. 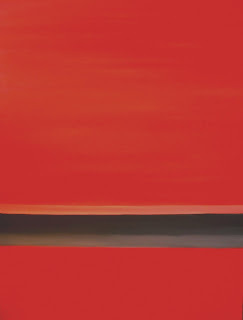 The Landscape Show includes all mediums, from photography to realism to abstract. 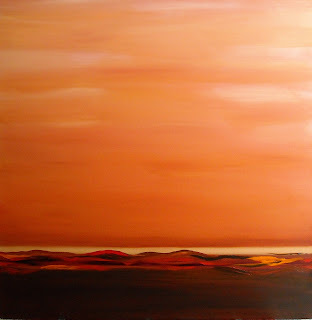 My entries are Abstract Landscapes and you can view some of these in the Art Slideshow. Or even better visit the exhibit until October 24th! 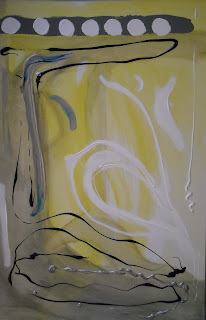 There will be an upcoming Abstract Exhibit at Art at the Center from October 14th through November 30th. 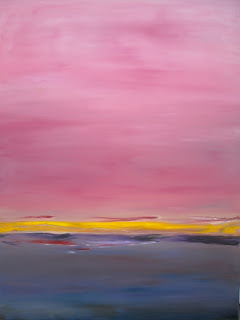 I will also feature one of my abstract landscapes in this show. These are both beautiful Art Galleries to visit during this fabulous autumn weather we are having in Kansas City. Last month I was involved in a benefit for Head for the Cure to help fund brain tumor research. It took place at an area art gallery, with great food, a terrific turnout, and many items for both silent and live auction. 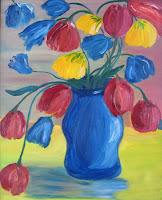 I thought what better way to cheer someone and raise money than to donate a bright floral painting. This weekend the renowned Plaza Art Fair is a major event in Kansas City. This juried art show features local as well as national artists of all mediums. I am attending The Renaissance fair with my daughter and little granddaughter Isabella tomorrow, so will plan to take in the Plaza Art Fair either tomorrow night or Sunday morning.